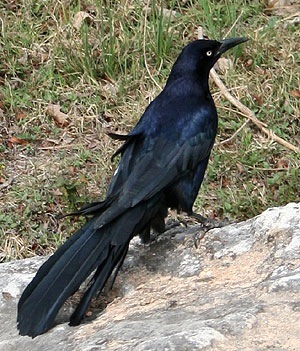 What am I doing here, I thought all grackles lived near the HEBs in Waco. A few years ago, I was sitting in the car outside of Target while my son slept. My wife, daughter, and mother-in-law went in to do some shopping. On this particular day, I was reading something in the backseat when a woman walked past the car on her way to the store and then turned around and walked back. She stopped right in front of my car and began to have a conversation. I’ve noticed that people tend to assume the cars around them are empty when walking through the parking lot. “What’re you doing here?” I heard her ask. There was no reply. “What’re you doing here?” she asked again, her pitch rising a bit as if that was the reason she had received no answer before. “What’re you doing here?” she asked a third time, like Jesus, reinstating Peter to carry on the ministry of the Kingdom. Here she was bringing healing and life. I stopped even trying to read and watched. It was then that I noticed that her posture was not one of a healer, but of an aggressor. Her shoulders were driven forward and her face leaned in toward the still unseen creature on the ground. Perhaps she was frightened that her attempts at kindness would be met with aggression from this wounded animal, and so, she mimicked a posture of aggression herself. Finally, she made her move. “I haven’t seen any grackles, what on earth do you think your doing. Shoo, now! You’re not supposed to be here,” she said, and she made a movement toward the bird, chasing it away from picking up the remains of Target food court refuse left on the ground beneath the cart return. Don’t get me wrong, I’m no great defender of the grackle. So far as I know, they are not an animal of particular interest to the Sierra Club. When I lived in Waco, they were a constant nuisance. Anywhere that food might drop, they migrated. They are not birds known for their cleanliness; in fact, they probably carry with them quite a bit of disease. In Waco, there was an employee of the city (or so the legend goes) who was hired simply to ride around town with a shotgun loaded with blanks and fire up in the air to scare the grackles away from various establishments. To me, they are unattractive and bothersome birds. But really, if they don’t come to my space, where else where they go? Have I built where they used to live? When I heard this woman talking to the bird, I really wasn’t thinking about the environmental impact of shopping centers, though I have since discovered that grackles had their habitat effected by human expansion early on, but now have a pattern of growth with human establishments, due to their ability to adapt and their “resourceful and opportunistic nature.” In other words, we are creating our own problem. I was thinking about the way that her posture stood to this small bird. This woman, who was not large by any human standards, stood towering over this bird who was bothering her, who was not to her liking. This is not a political concern for me. My faith is larger than my politics. This is a God issue for me. God, this One who is trying to bring everything together…I wonder what God thinks of the boundaries we are so hell bent on drawing in order to protect our own interests. If Jesus is Lord, then we must understand that he is Lord of all, and let our actions follow that belief. Jesus may be my Lord, but I am professing that he is Lord of all. If that’s the case, then who am I to exclude my brother from the table. Not the table of America, the table of Life, the table of Christ. My hope and my prayer is that the posture of my life would be open. My shoulders would be relaxed and my face drawn in a permanent smile that welcomes the world to the God I know. My prayer is that God would eradicate in my life the word of negation the don’t that breathes in my small and scared self. May it be replaced by the affirmation of my sacred self so that with my life I take the time to turn around and say, “You belong here” to all the grackles (myself included) that I may encounter.